With the exception of an occasional tarball, the beaches may look clean, but just like dirty ocean water where you can’t see the bacteria, the truth is more subtle. 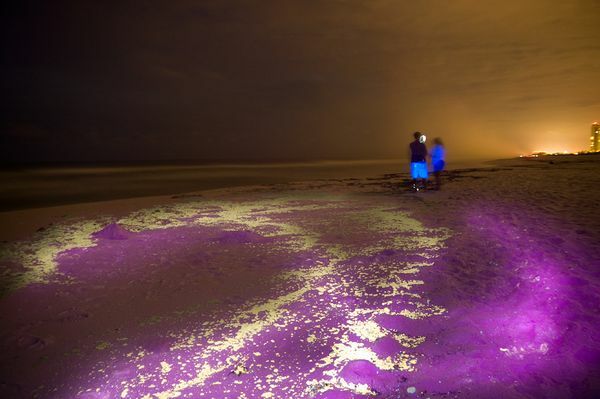 Researchers from the University of South Florida Coastal Research Lab are using ultraviolet lights to expose oil that is still on the beaches that appear clean to the naked eye. The question remains what are the ecosystem and health impacts of this invisible sheen of oil (and perhaps dispersant). Click here for more of Chris’ stunning photos. Learn more on Surfrider’s Oil is Not the Answer Blog.